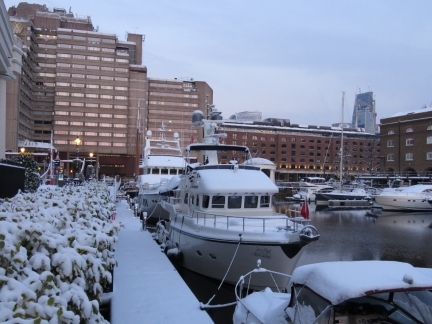 St. Katharine Docks in London was a fabulous base for a winter visit to London. 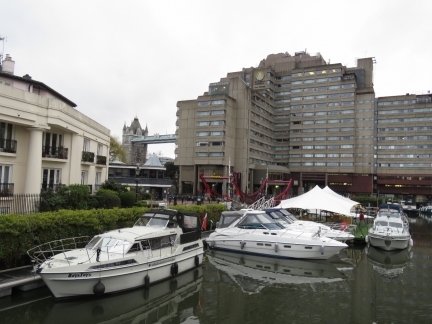 In addition to the marina, the St. Katharine Docks complex includes nearly a dozen excellent restaurants, is adjacent to the Tower of London, within walking distance of many other local attractions and restaurants, and convenient to public transport. 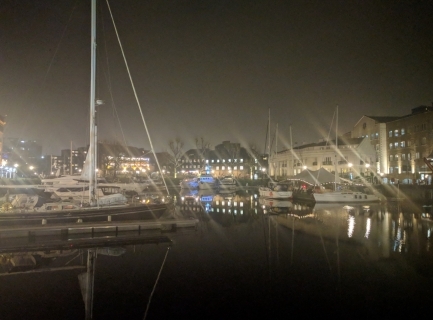 And the marina is world-class. 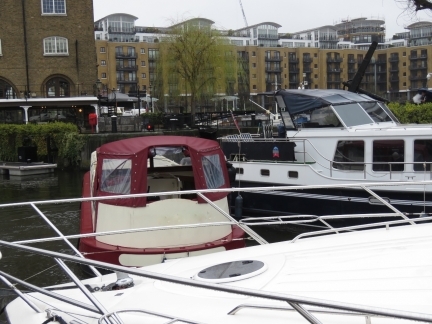 New owners have completely replaced the dock and infrastructure, and now encourage visiting boaters, compared to the previous owners who preferred long-term leaseholders. During our two months at St. Katharine Docks we visited many of the local highlights, made a two-night trip through the Channel Tunnel to Paris, met up with old friends and made new ones, and also found time to complete several projects and to-do list items. For the 207nm run from Southampton to London, we were planning to stop for the night in Queenborough off the mouth of the Thames before continuing to London the following morning. 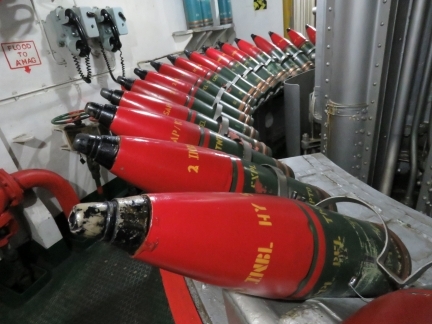 This would avoid a night running up the Thames. But we made much better time than expected, arriving at the Thames mid-morning, so continued through to London. 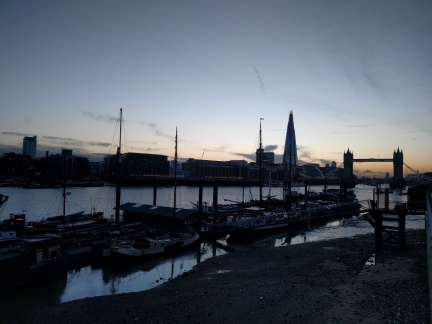 We arrived just past dusk and stopped for the night at Hermitage Moorings with an incredible view to Tower Bridge and the Shard. 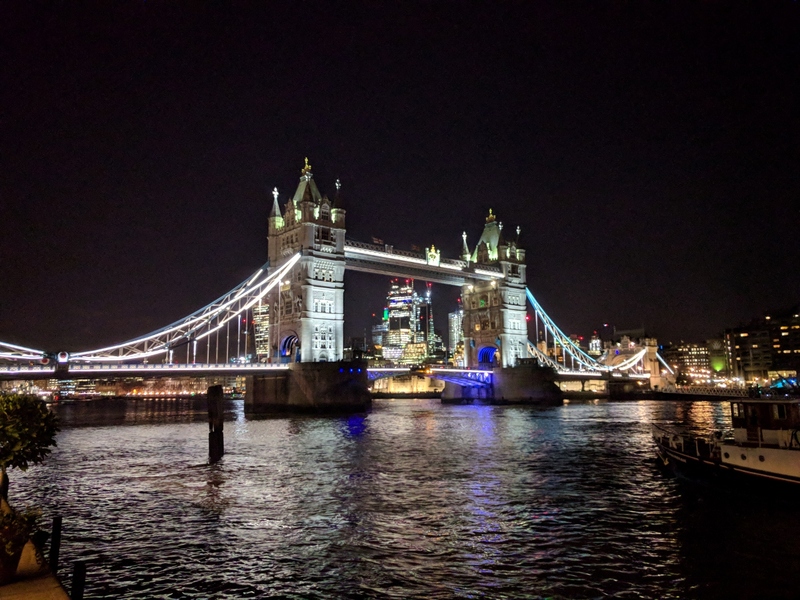 We had a wonderful run up the Thames and were incredibly excited to finally reach London. Over a decade ago, we read a magazine article about a couple who moored their boat at St. Katharine Docks over the winter and it captivated us—we’ve been wanting to come here ever since. From Hermitage Community Moorings, we made a short run upriver and passed through the lock into St. Katherine Docks. It was amazing to actually be there. London is a world-class city with modern architecture, a world financial center, and easy-to-see history going back more than two thousand years. We got a taste of it all on a clear day shortly after arriving into St. Katharine Docks. 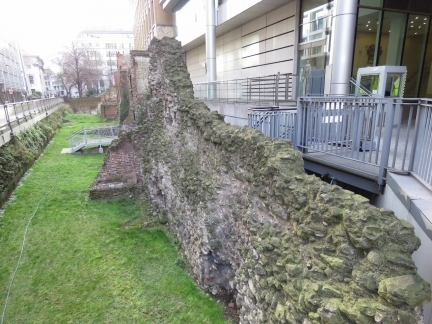 We started with the fabulous views from The Shard, completed in 2012, and stepped back two millenium to visit Roman Walls dating from 200AD. Over the course of the day, we viewed architecture throughout the centuries and finished up in the modern finanical center. 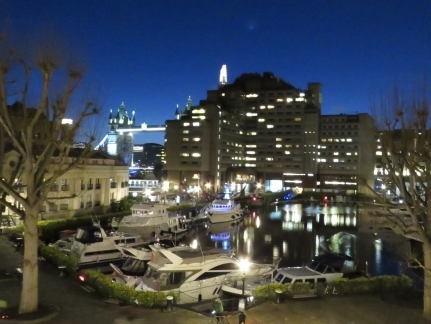 Celebrating Valentine’s Day with an excellent meal at Strada Italian restaurant at the St. Katharine Docks complex. 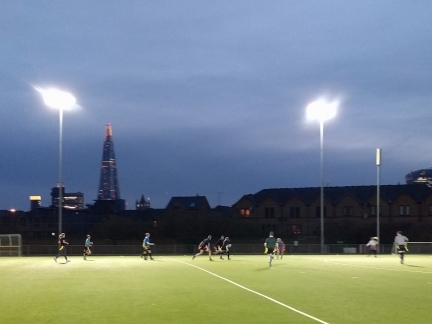 We’d always thought the Tower of London was just that, a tower. 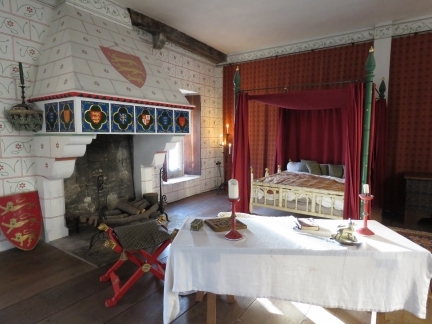 But it’s actually a castle, with 22 towers in total, that was the royal residence for England’s medieval monarchs and also is where the Crown Jewels are currently kept. The complex is right next to St. Katharine Docks where we are moored, so one sunny morning we spent a few hours touring the complex and learning about it’s history. Every Friday, vendors setup stalls at St. Katharine Docks selling delicious street food from all over the world. The famed Royal Observatory in Greenwich is the location of the Prime Meridian and the origin “Greenwich Mean Time”. 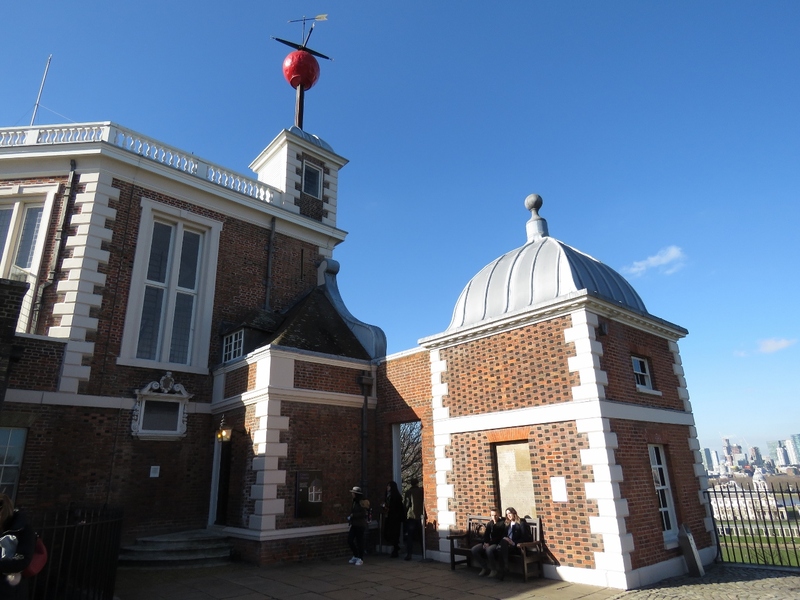 The observatory has an excellent museum detailing the search for an accurate means of calculating longitude at sea, plus sweeping views from its hilltop perch. 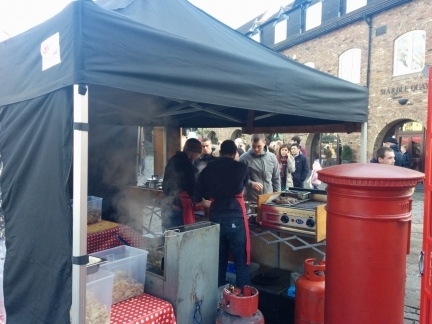 Other Greenwich attractions include the old Royal Naval College grounds, the National Maritime Museum, and the Cutty Sark, the last of the great 19th-century tea clippers that sailed between England and China. 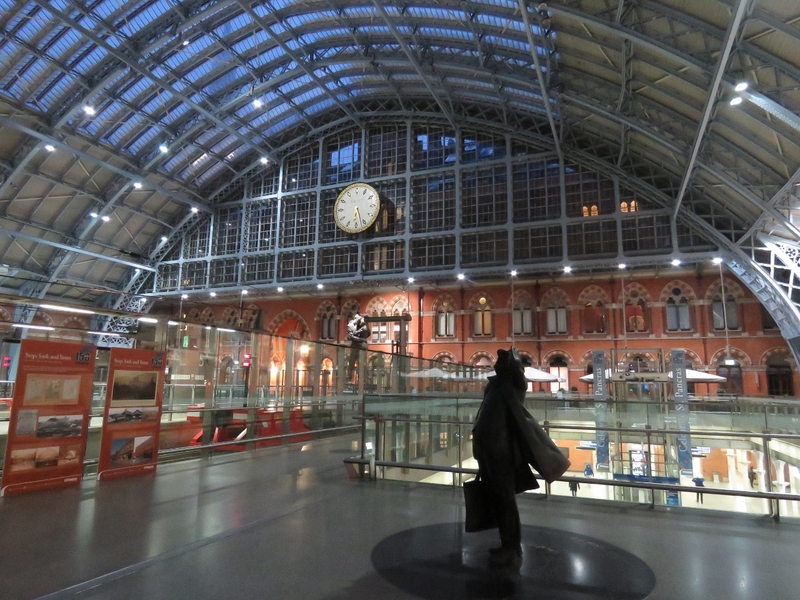 This morning we took the high-speed train from London through the Channel Tunnel for a 2-night trip to Paris. It seems kind of amazing that we could get up in the morning, do some work on the boat in London and later have lunch by the Eiffel Tower, all without leaving the ground. 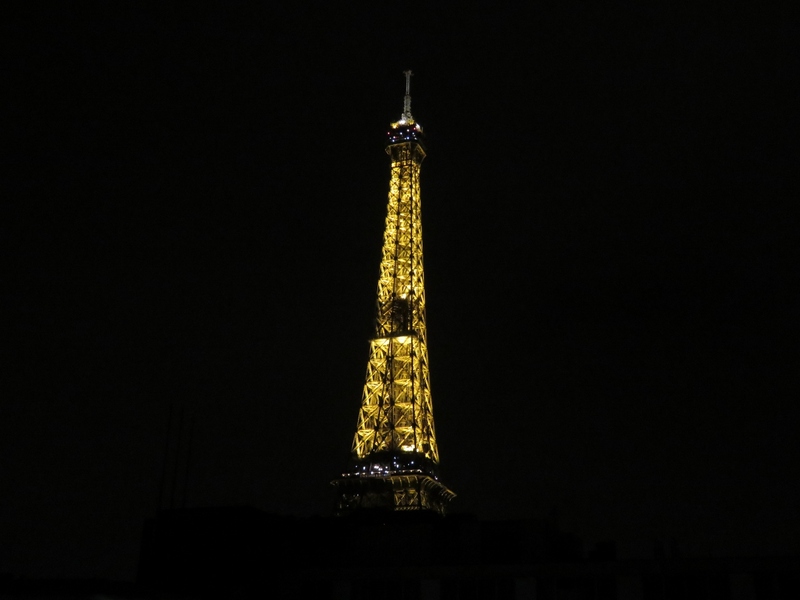 This was our first time in Paris and we had an excellent time taking in the sights, including the Effiel Tower, the Arc de Triomphe, Notre-Dame Cathedral, and the Louvre. 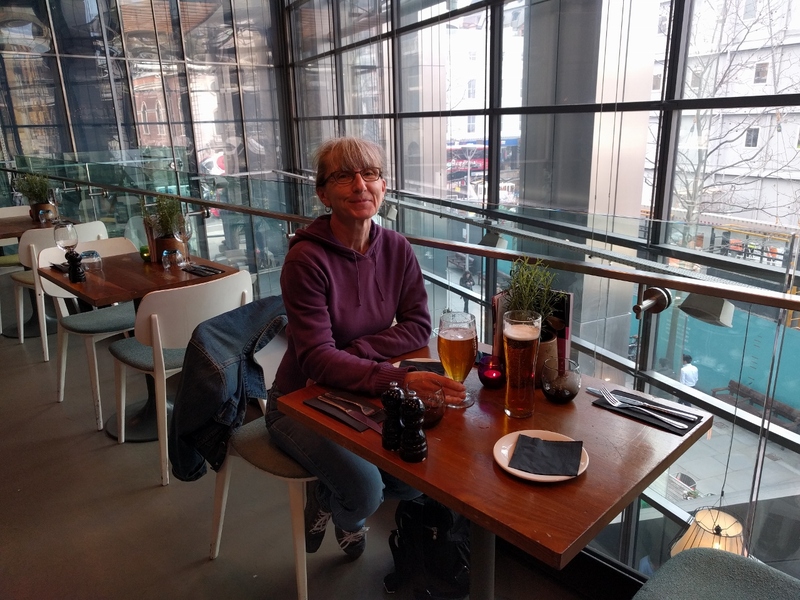 We’d arranged the trip to coincide with the dates that our friends Kathy Hearn and Dave Gillies would also be there. We’ve known Kathy and Dave since the late 1980s when we all worked together at the IBM Toronto Lab. We’d not seen them since we left Seattle—it was wonderful to get together and catch up. 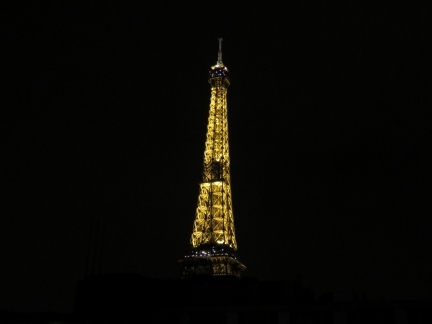 And Paris is such an awesome place to meet. 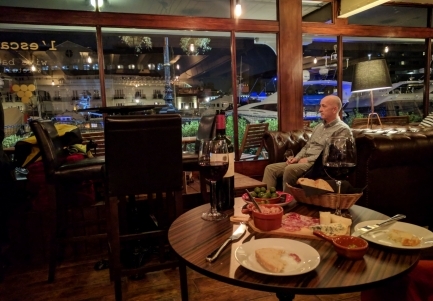 Enjoying an exceptional bottle of wine and the charcuterie and cheese tray at L’escale Wine Bar, with a view to Dirona (left) moored at St. Katharine Docks. 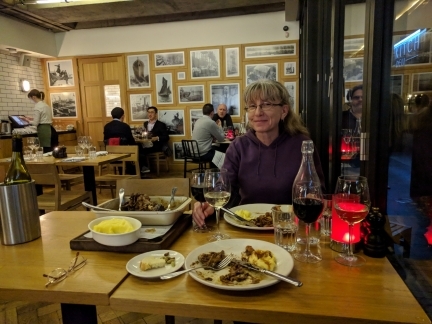 Sharing the delicious Seven Hour Confit Herdwick Lamb at Tom’s Kitchen in St. Katharine Docks. A custom barge with an unusual superstructure leaving St. Katharine Docks. Three Nordhavns are at St. Katharine Docks now. When we arrived, N55 Shogun was berthed temporarily where Dirona currently is. We moved forward when Shogun moved back to its regular berth at the far right of the photo. And N68 Vesper arrived while we were in Paris. We last saw Vesper at Hamble Point near Southampton, but haven’t seen owners Bob and Kathy Valleau since Stornoway in the Outer Hebrides. The beautiful bar at the Prospect of Whitby, London’s oldest riverside pub dating from 1520. 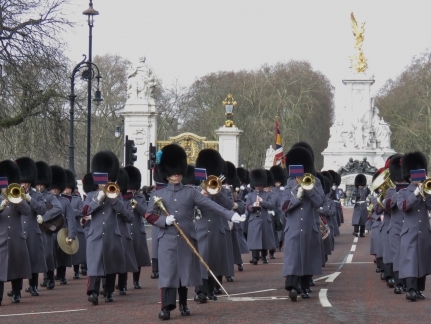 The most well-known portion of the Changing of the Guard ceremony takes place on the Buckingham Palace grounds. But this is just the middle part of the ceremony, and the hardest to watch due to the crowds that form well in advance. Better views can be had of the guards marching to and from St. James’ Palace and Wellington Barracks before and after the ceremony. And you might also catch the Queen’s Life Guard riding horseback en route to their own Changing of the Guard ceremony. With snow falling on London, we spent much of the day in Westminster. There we watched the Changing of the Guard, visited the excellent Churchill War Rooms museum, and passed 10 Downing Street. And not to have too much fun, we capped of the day with a visit to the ophthalmologist. 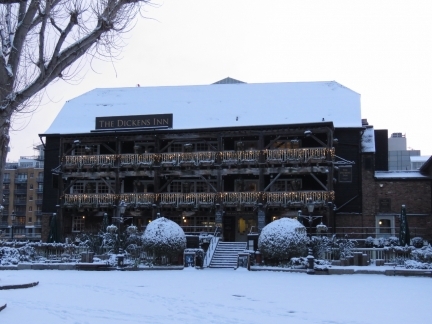 We’re expecting unusually cold temperatures with snow this week. This morning’s temperature already is below freezing at 29.7°F (-1.3°C) and we’re just getting started. Evening at St. Katharine Docks with a light dusting of snow. We’re down to 28.3°F (-2.1°C) this morning and have colder weather and lots more snow coming. 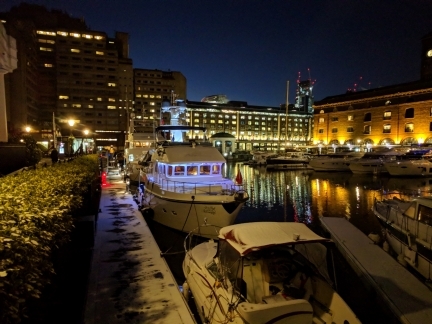 We got a few inches of snow last night—the marina looks beautiful this morning. 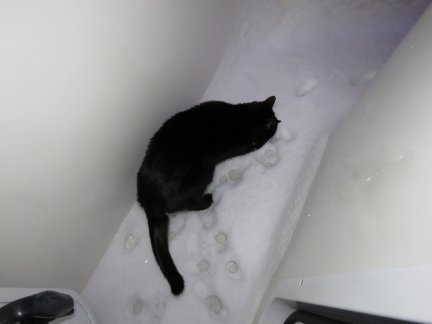 Spitfire out eating snow with his paw and enjoying running all over the snowy boat. Everything looks beautiful in the snow, but the Dickens Inn really stands out. The fuel barge Conquestor arrives regularly to fuel the marina boats. The temperature dropped even further to 25.8°F (-3.4°C) this morning. 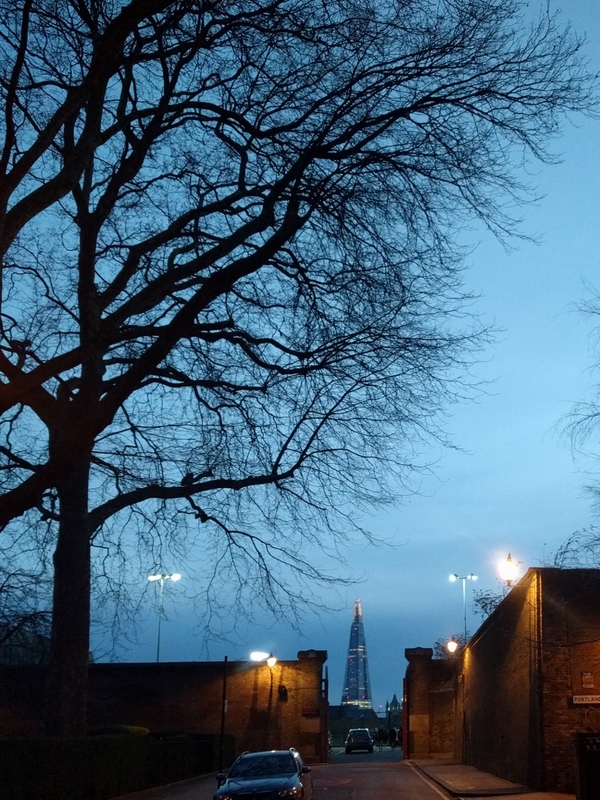 This is unusually cold for London. 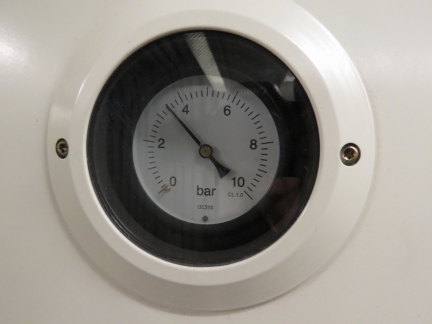 While riding the tube to King’s Cross station, we noticed each carriage has a pressure gauge mounted on the wall. Watching this guage you can see the braking pressure applied by the train operator. It’s fun to watch as we go in and out of stations and through switches. 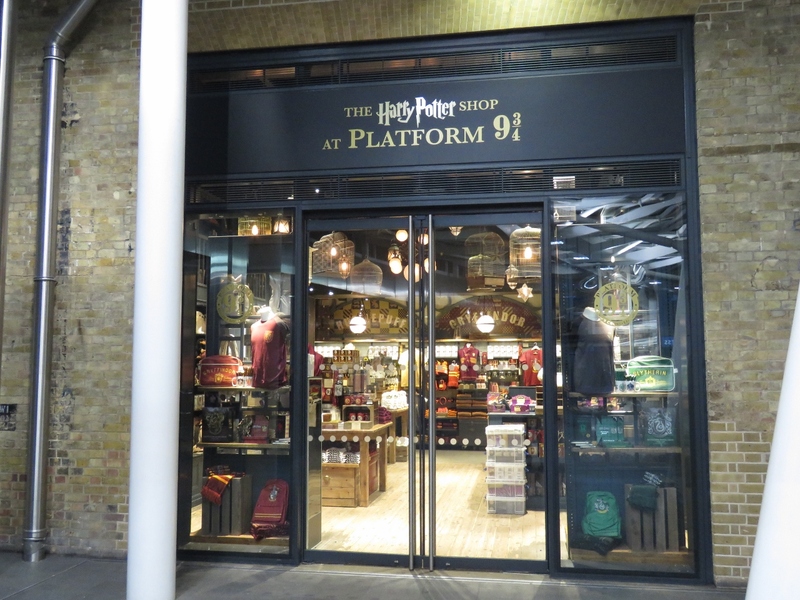 The Harry Potter store at Platform 9 3/4 in King’s Cross station. In JK Rowling’s Harry Potter books, aspiring wizards catch the Hogwarts Express by dashing through a brick wall between Platform 9 and 10 at King’s Cross Station, called Platform 9 3/4. Next to the store is a recreation of that wall, with a luggage cart embedded partway through. 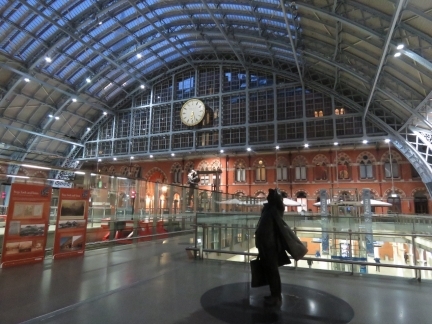 The beautifully-restored interior of St. Pancras train station, adjacent to King’s Cross station. The station first went into service in 1868 and was renovated in the late 20th century as the terminus for the Channel Tunnel Rail Link. This is where we took boarded our train to Paris. 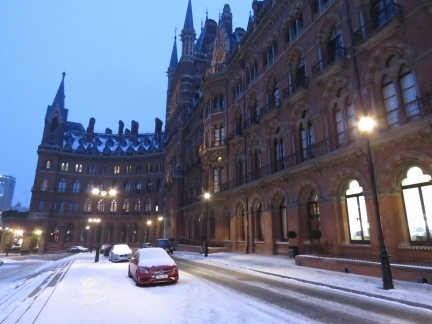 A snowy St. Pancras exterior. We were at King’s Cross to catch a train north to Leeds and then to the take the scenic Settle-Carlisle train trip. But our train from London was cancelled due to the weather, so we took a few photos and returned back to Dirona. 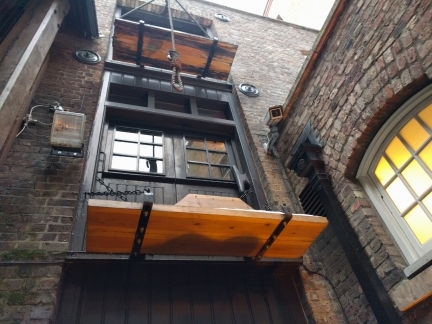 We didn’t notice the hangman’s noose just above the entrance to the Captain Kidd last time we were here. Riding the Central Line underground from Liverpool Station to Hatton Garden. 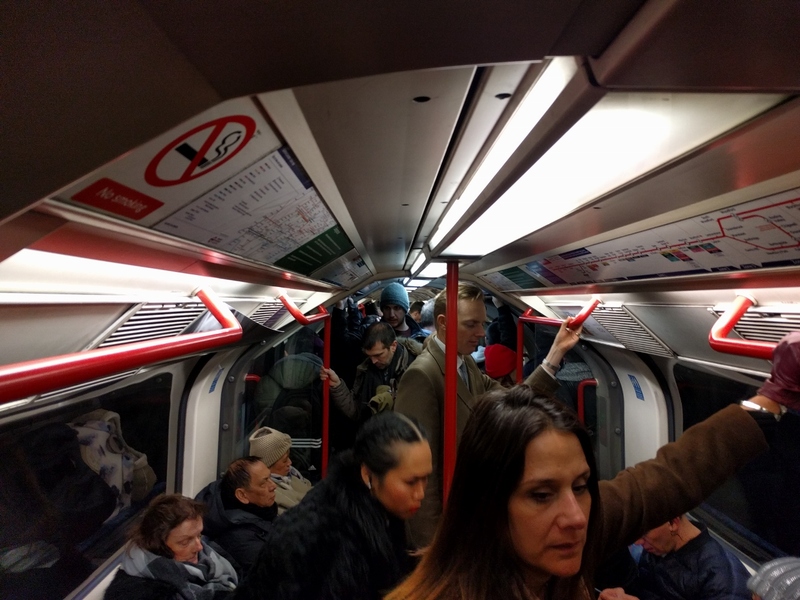 The carriages on the Central Line are much narrower than those on the District and Circle lines that we often use. 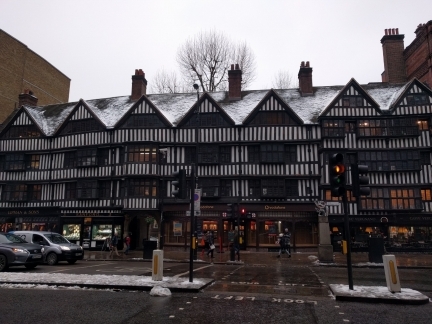 The Tudor-style Staple Inn dates from 1585 and caught our eye as an interesting architecture for downtown London. Staple is a medieval term referring to a system of trade and taxation—the Staple Inn was originally a wool staple where wool was weighed and taxed. 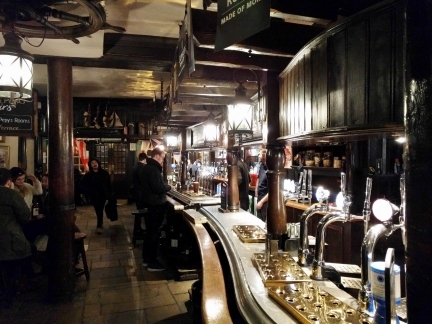 Ye Olde Mitre, built in 1546, dates from even earlier than the Staple Inn. It’s a wonderful pub tucked away on a small alley off Hatton Garden. 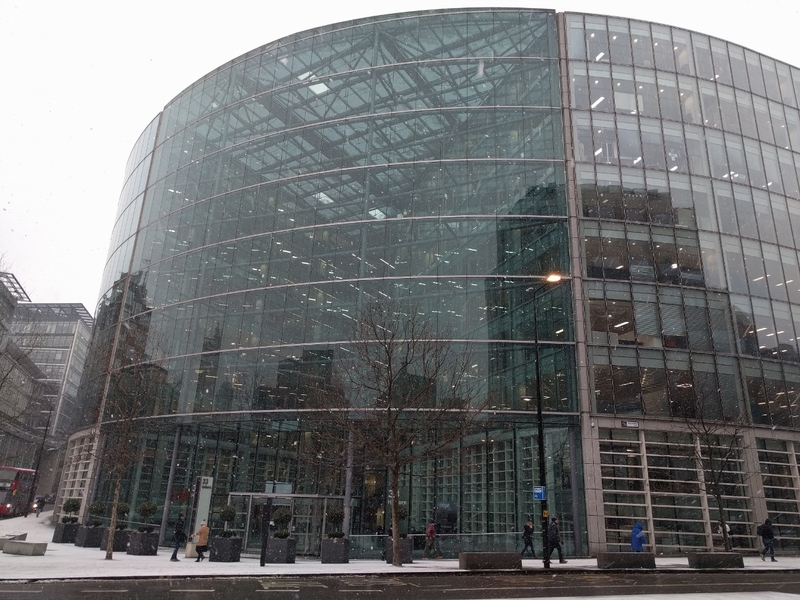 The dramatic glass atrium at 33 Holborn, one of London’s many striking buildings. 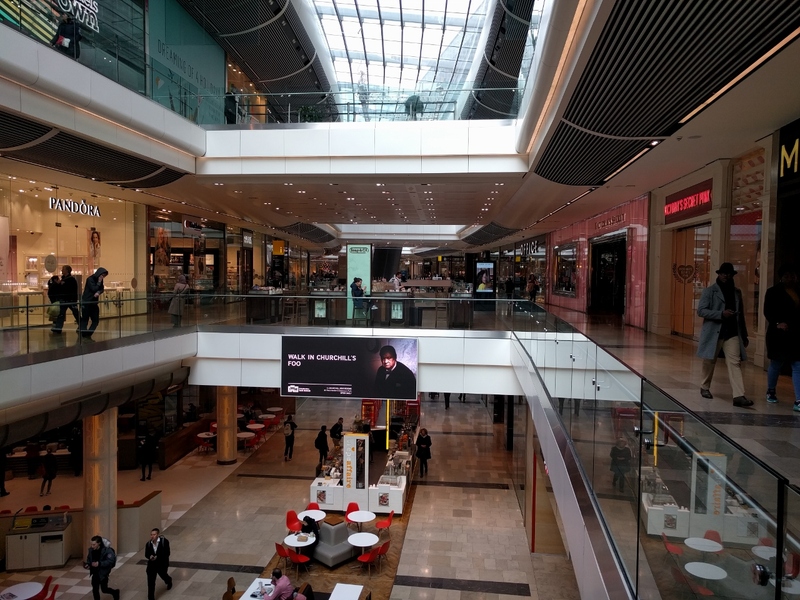 Stratford City, on the outskirts of London, has seen some some major construction in the current millenium. The city played host to the 2012 summer Olympics one year after the opening of Westfield Stratford city, the third largest shopping mall in the UK and one of the largest in Europe. 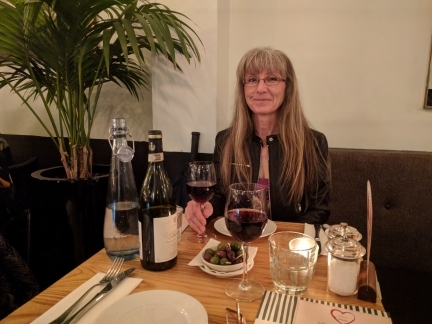 Enjoying another excellent bottle of wine over dinner at one of our favourite haunts in St. Katharine Docks: L’escale Wine Bar. 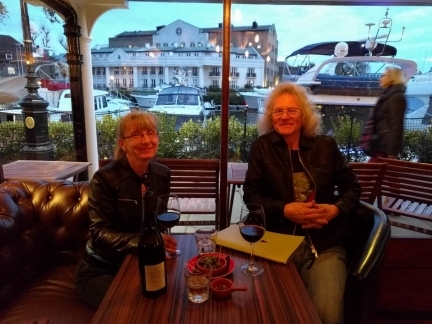 Dirona is just visible behind us. 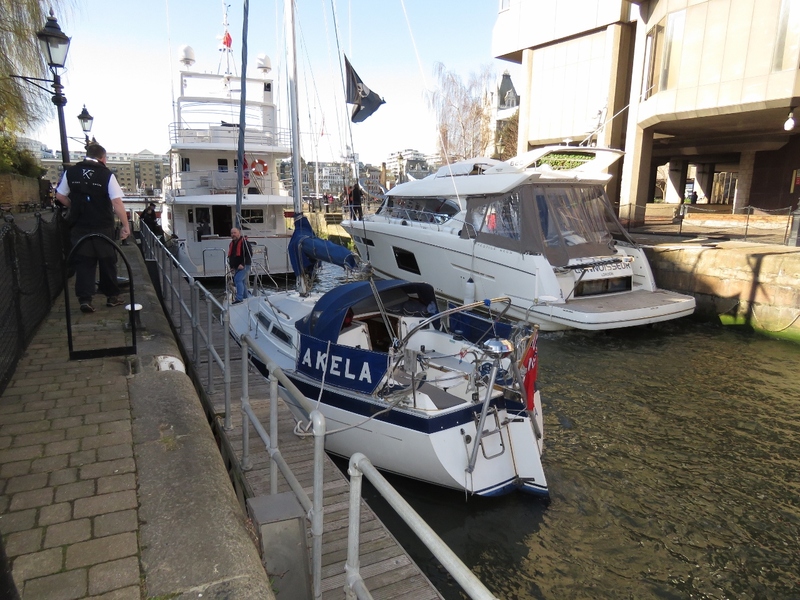 We moved the boat today to another berth. Shortly after unplugging, we got this automated mail from the marina indicating our power was unplugged. 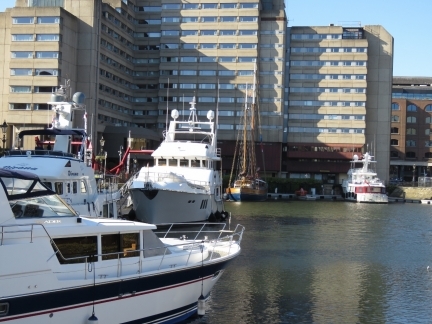 It’s a rare marina that tracks and alerts on power outages at a boat. 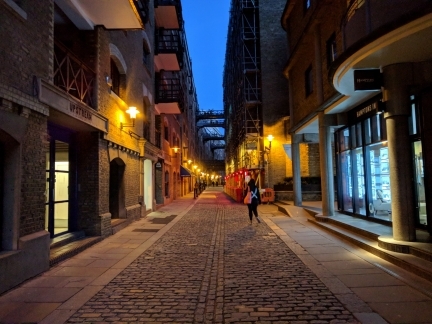 Looking down Shad Thames, directly opposite St. Katharine Docks across the Thames. 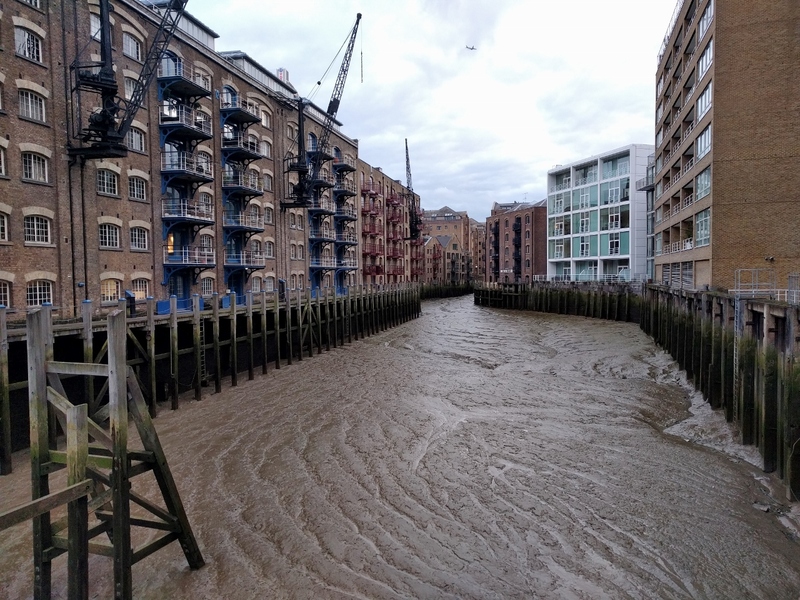 The building on the left is Butler’s Wharf, built as a warehouse in the late 1800s and now converted to apartments, shops and restaurants. 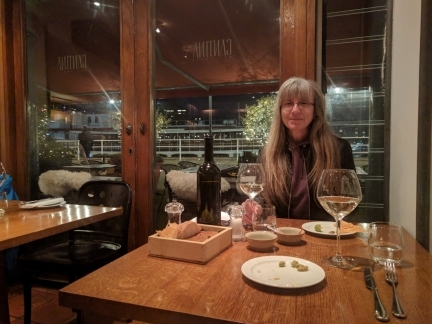 An excellent meal at Cantina del Ponte Italian restaurant in Butler’s Wharf overlooking the Thames. A great view to Tower Bridge from the Thames side of Butler’s Wharf. 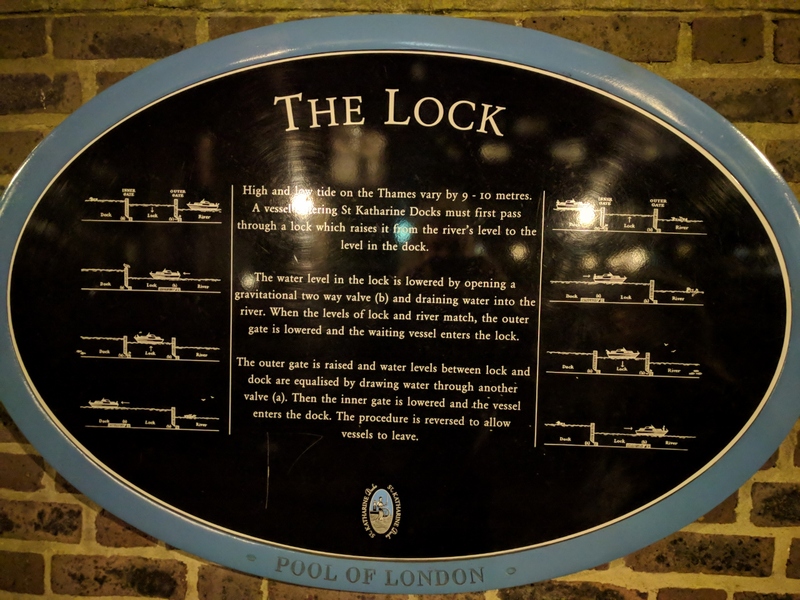 This plaque on the wall at St. Katharine Docks explaining how the locks work gets a lot of attention from people passing by. The HMS Belfast was launched in 1938 and saw action in World War II, including firing some of the first shots on D-Day. The ship also was part of the United Nations naval forces during the Korean War. 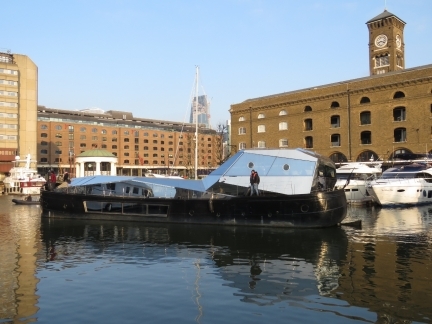 In 1971, the retired ship was brought to London and moored along the Thames by Tower Bridge as a floating museum. St. Katharine Docks has an in-place pump-out service for most of the berths. 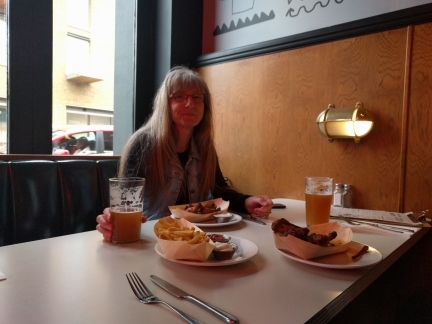 We had a great lunch at the Crutched Friar. The place was empty when we arrived shortly past noon, but by 1pm it was packed to standing-room only with local business people. 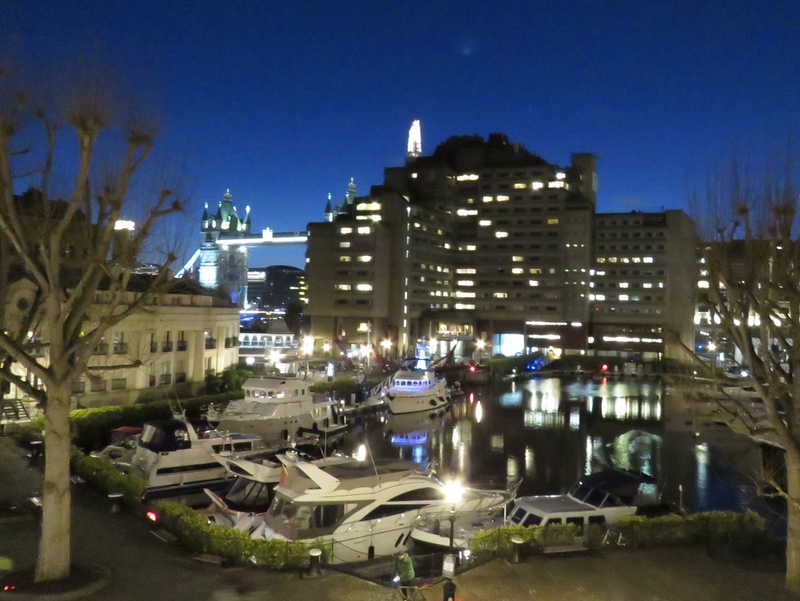 Dusk overlooking Hermitage Moorings where we stopped for our first night in London. 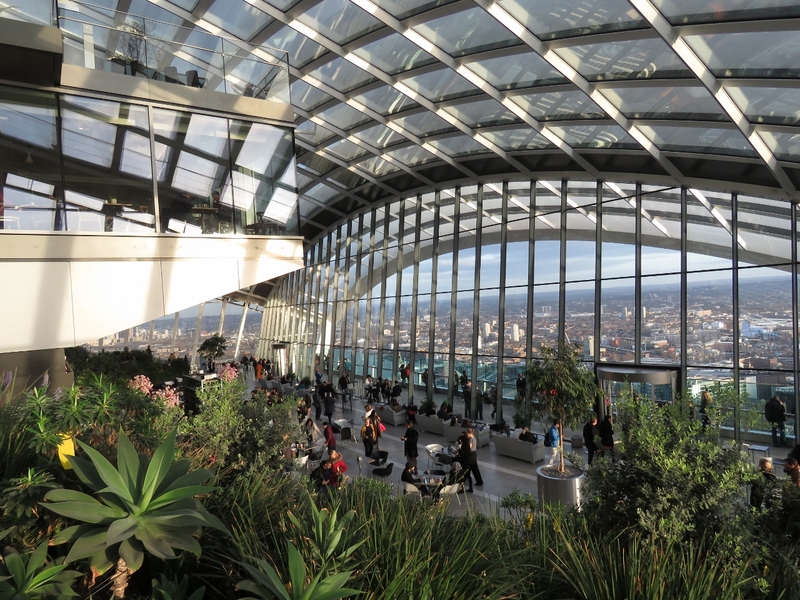 We continued from here to River View restaurant, where we had an excellent meal with a view to Canary Wharf. We had a wonderful lunch on the balcony at Drift Restaurant overlooking their bar after picking up our new eyeglasses at nearby Specsavers. 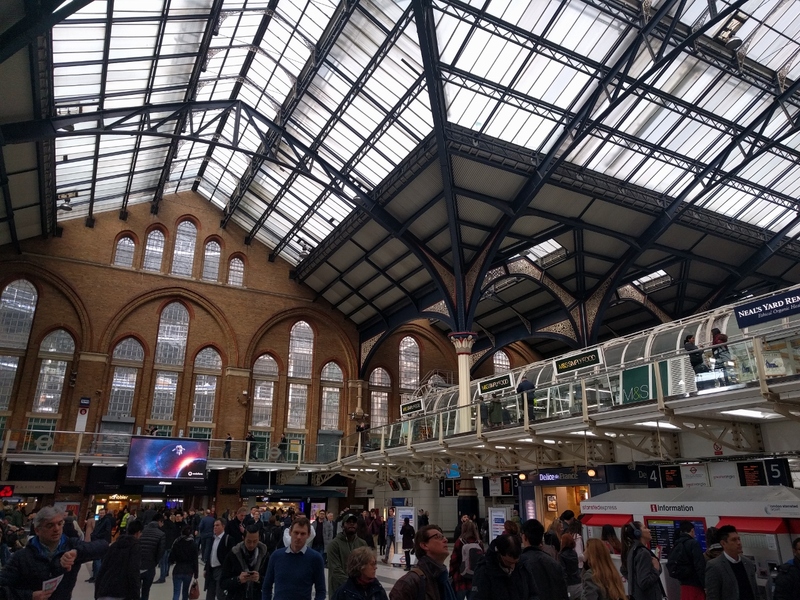 The vaulted glass ceiling in Liverpool Station where we took the tube to Hatton Garden to pickup Jennifer’s repaired jewelry. Even though we’d just had lunch and weren’t hungry, out mouths were watering at the delicious smells of the street food along Leather Lane one block off Hatton Garden. The snow we had in early March had all melted and the weather was warming up. 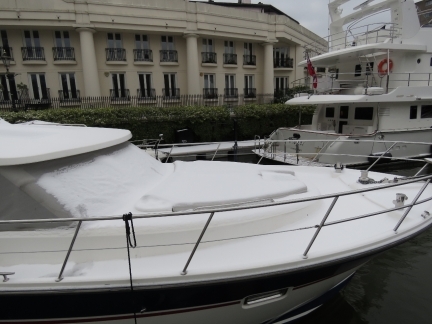 But we had another temperature drop with more snow overnight. 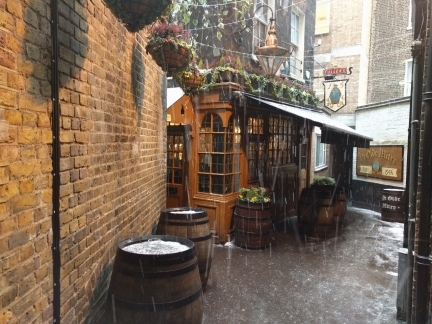 This didn’t last long, nor cause nearly the disruption to the transportation system as the earlier weather did. Sky Garden is a public space at the top of the “Walkie Talkie” with a fabulous 360-degree views of London and the Thames. Several restaurants and a bar also are within—we had a memorable dinner at the Darwin Brasserie, the room jutting out from the left above the gardens in the picture. 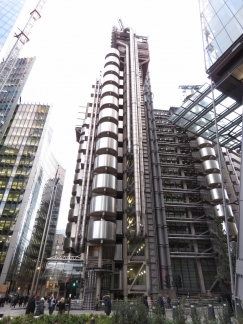 Lloyd’s of London is not an insurance company. 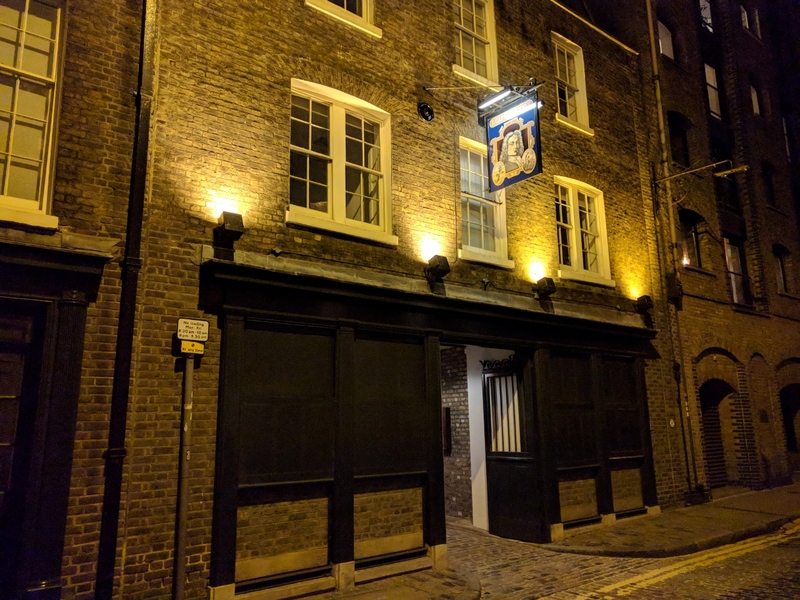 Rather, it is an insurance market founded in the 1600s when Edward Lloyd began renting out space in his coffee shop to marine underwriters. 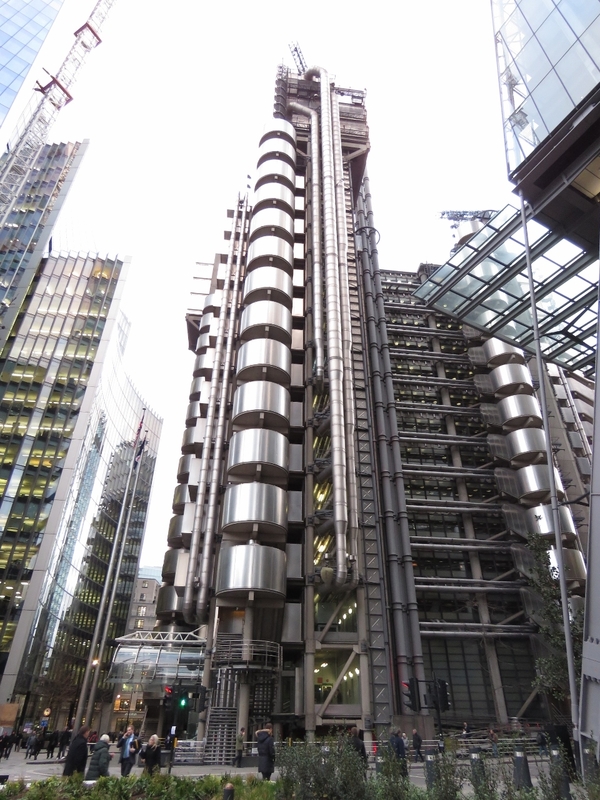 Lloyd’s current headquarters is a masterpiece of modern architecture built in the Bowellism style, where interior space is maximized by placing the building services, such as ducts, sewage pipes and elevators, on the exterior. 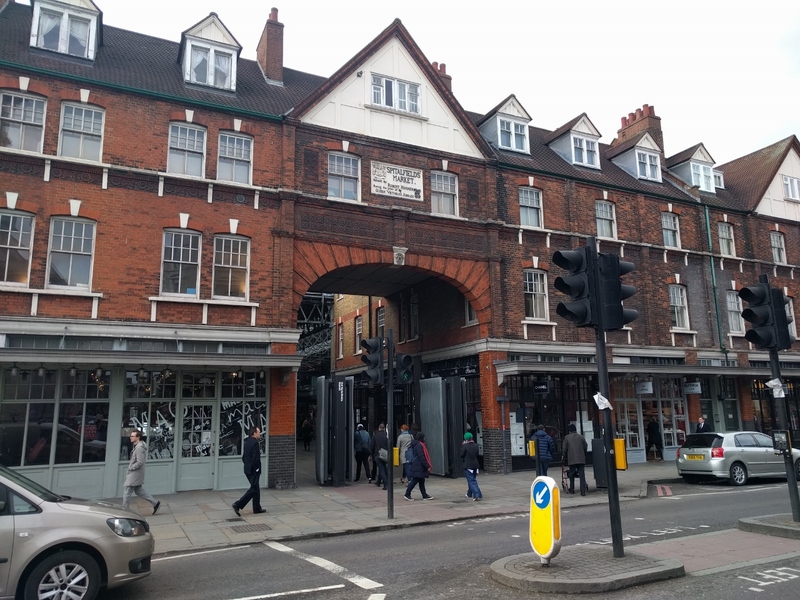 The building may be modern, but the market continues to operate much as it did in the early days. Insurance brokers still bring risks, in person, to underwriters who evaluate, price and accept the risks in a huge central underwriting space known traditionally as “The Room”. The royal barge Gloriana departing her home port of St. Katharine Docks. The 90-foot (27m) vessel is powered by 18 oarsmen and/or two electric inboard engines, and can carry an additional 34 passengers and crew. 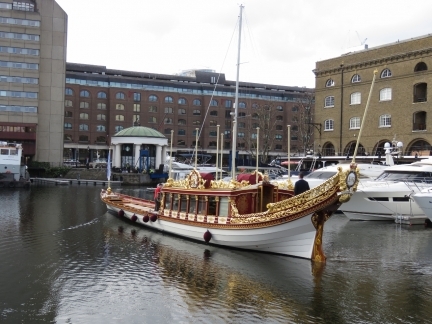 Designed after the Lord Mayor of London’s boat in the 1800s, it is built of wood using traditional methods. Nordhavn 68 Vesper underway to depart London. We had a great time with owners Bob and Kathy Valleau as neighbours over the past month. Hopefully our paths will cross again soon. 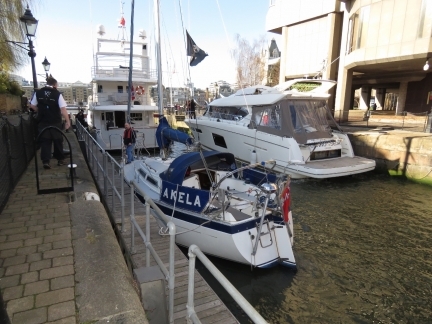 We’ve only ever seen one boat in the St. Katharine Dock lock. Today there were two other boats with Vesper and if the fuel barge was ready to leave it would have been in there as well. It must get very crowded at the height of the summer season. 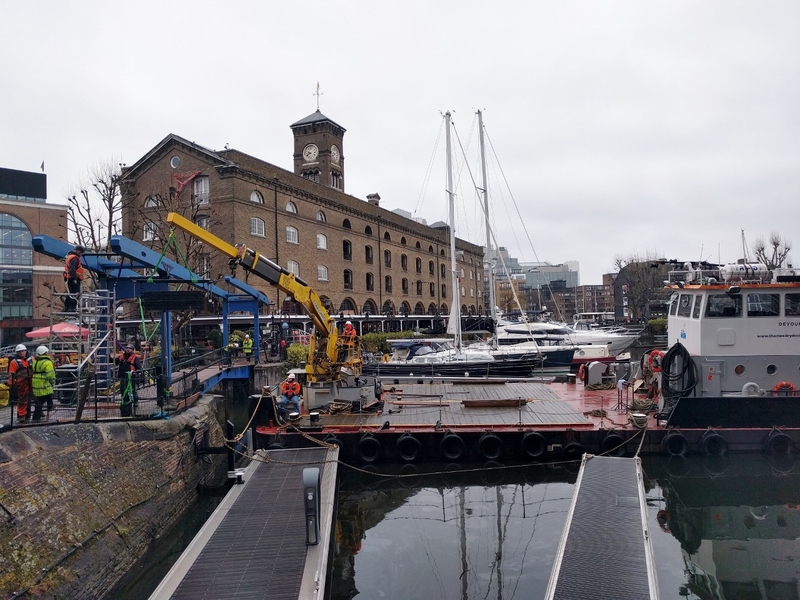 The footbridge across the channel between the central and west basins at St. Katharine Docks has been removed for renovation since we arrived. A construction crew, working off a barge, has been putting the bridge back in place this week. Tower Bridge Moorings, near Butler’s Wharf on the south bank of the Thames, with Canary Wharf in the distance on the left. 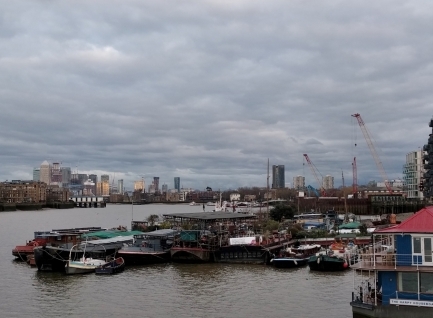 Several dozen barges rafted together are home to a community of more than 100 people with an award-winning communal garden running throughout the walkways. Low tide looking south into St. Saviours Dock basin. Not surprisingly, nearby advertisements for the expensive apartments on either side show the waterway at high tide. 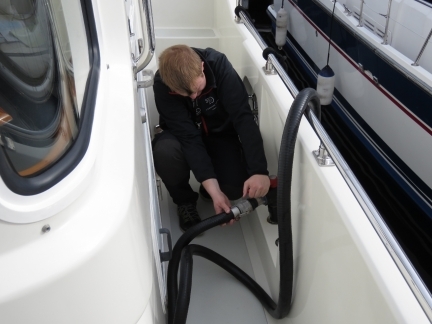 The marina has been placing lines, marked by fenders, to moor boats for an upcoming event. One of the fenders is visible off the port side of Yarona and another is just visible off the starboard stern of the forward boat (click image for a larger view). 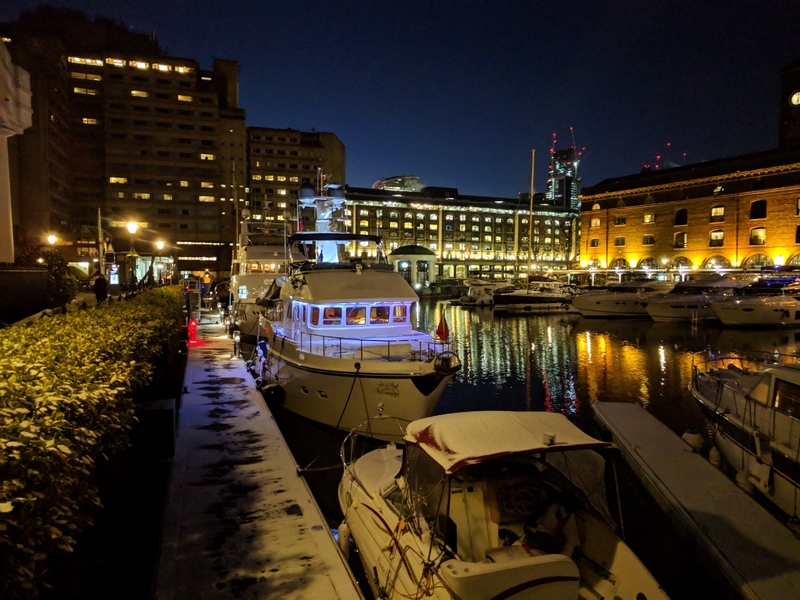 We’ve heard the marina warn departing boats of the fenders earlier this week, but neither crew seemed aware of the lines in the water and the forward boat got hung up on one of the lines. 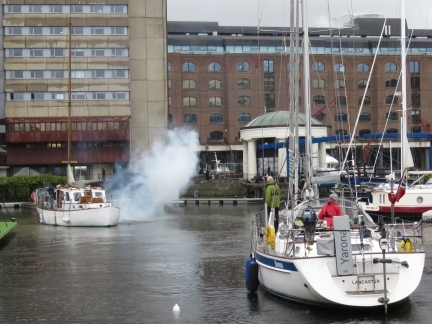 The big puff of smoke is from them trying to wrest free. They eventually tied off on the far side of the basin to clear the mechanical systems Yarona continued out through the lock. 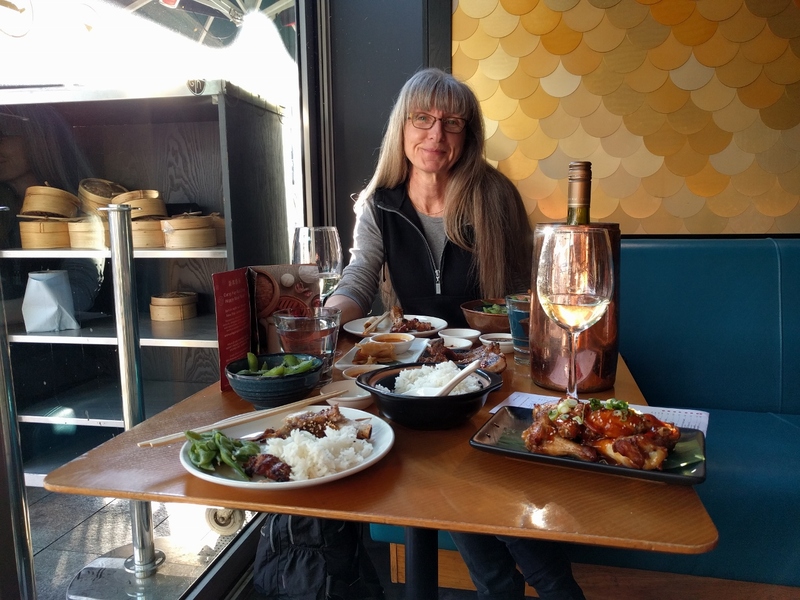 A great meal at Ping Pong Dim Sum restaurant at St. Katharine Docks. 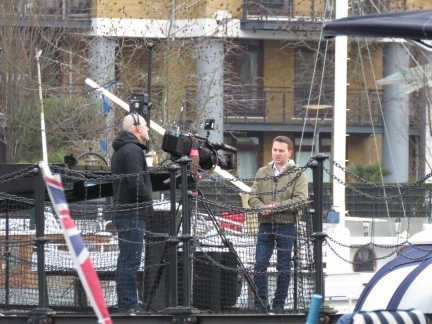 A video crew was out filming at St. Katharine Docks this morning. 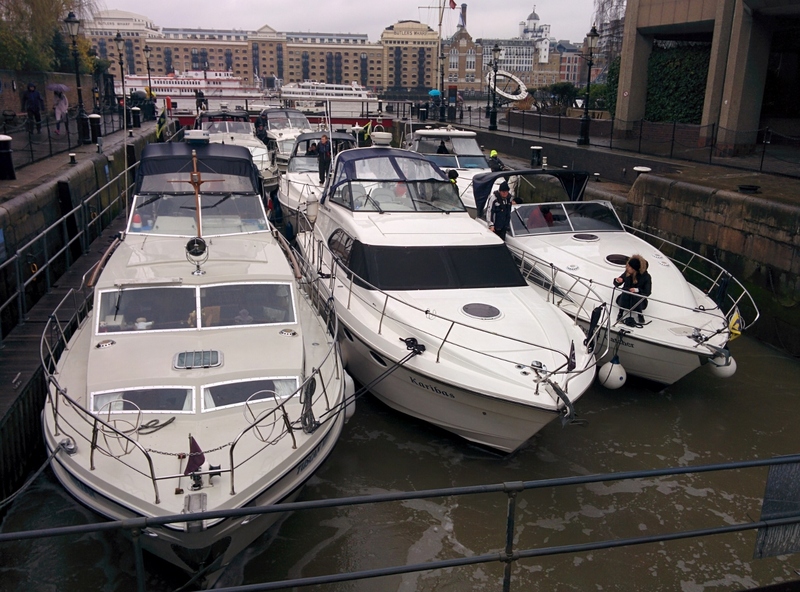 A full lock at St. Katharine Docks as the Windsor Yacht Club arrives from an all-day cruise. Their club is located about 22 miles upriver from here as the crow flies, but probably close to double that in the winding Thames. 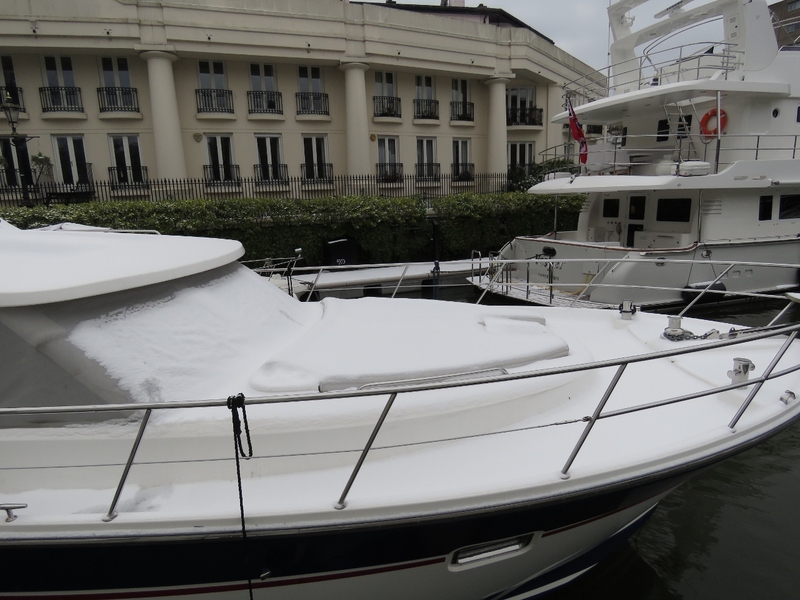 The Windsor Yacht Club settled in for the Easter Weekend. 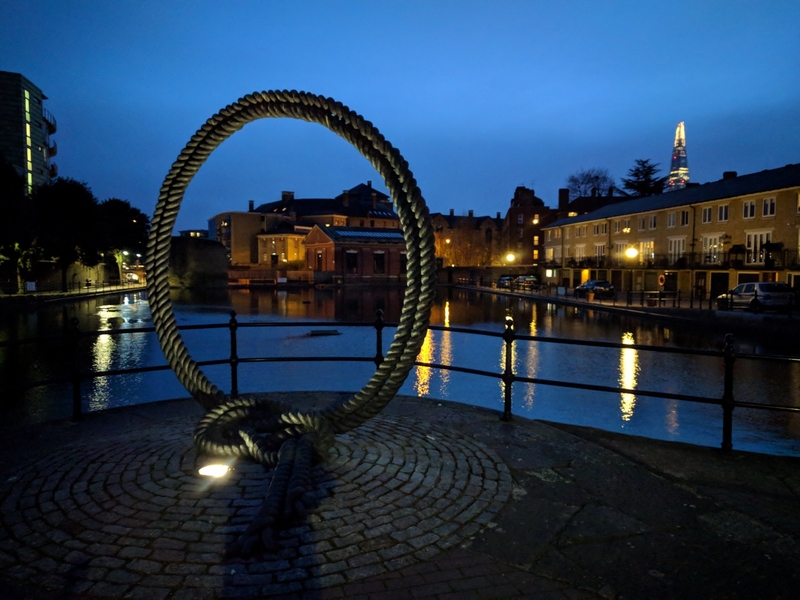 St. Katharine Docks has been working on setting up their area for the past few weeks—it’s one of the reasons we moved to another berth earlier this month and why the fender-marked lines that a boat fouled on were strung in the basin. it looks like a great spot for a rendezvous, with a covered social area to moor the boats around. 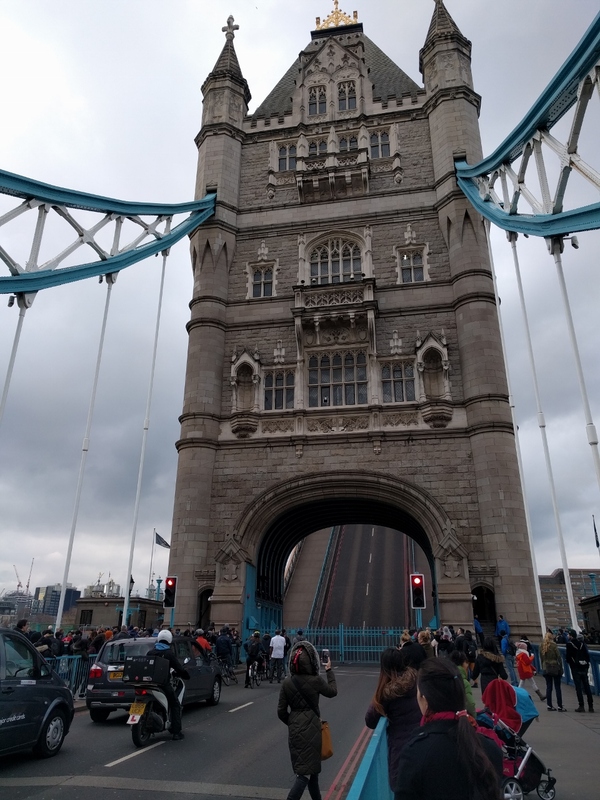 While walking to our new-favourite pub, The Draft House, we barely made it across Tower Bridge before it opened to allow a tour boat to pass under. We’ve not seen the Tower Bridge opened before—traffic sure backs up in a hurry. 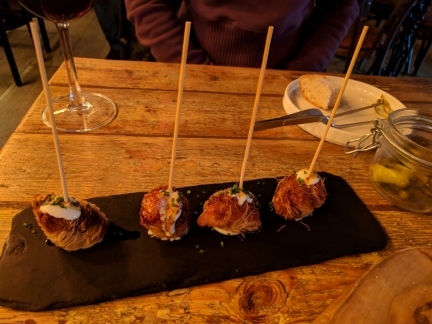 The crispy piquillo-wrapped prawns at Bravas Tapas in St. Katharine Docks tasted as good as they looked. Spitalfields Market started in 1638, was covered in the late 19th century and modernized in 2006. 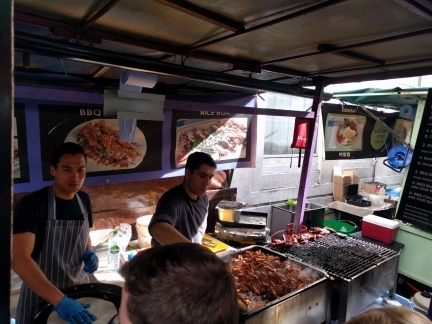 The market is full of small vendors selling wares ranging from jewelery to fresh vegetables with many food stalls and restaurants. We made a pass through the market and surrounding area as part of a trip to pick up some electrical supplies. A great view to The Shard looking west along Trench St. in Wapping. We’d had another good meal at the River View restaurant and walked back through the residential areas in Wapping. Co-ed flag rugby at John Orwell Sports Center in Wapping with The Shard in the background. Looking through the Rope Circle sculpture to Hermitage Basin with with omnipresent Shard visible on the right. The basin was built in the early 1800s to create a second entrance from the Thames to Shadwell Basin near the Prospect of Whitby pub. The foreground brick building visible through Rope Circle is the old pumphouse used to control the level in the basin. 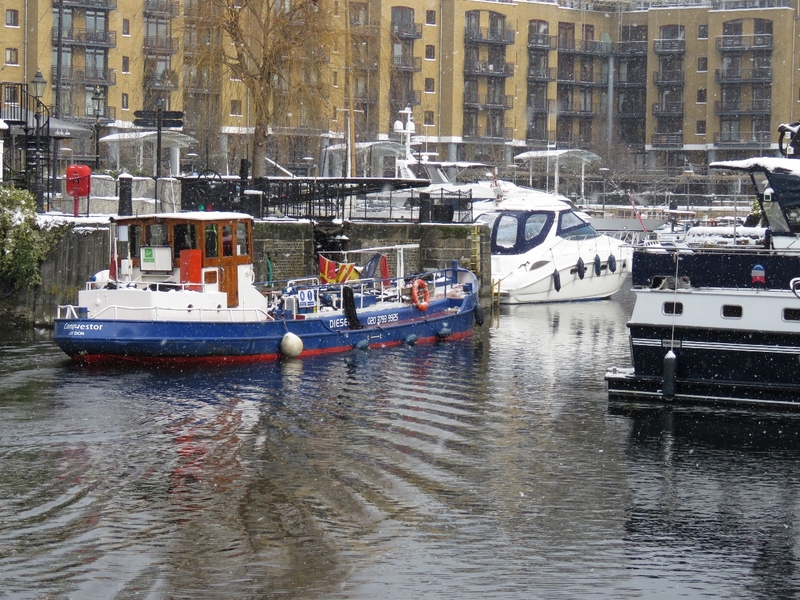 Ornamental Canal once led from the Thames via Hermitage Basin to Shadwell Basin, near the Prospect of Whitby pub. 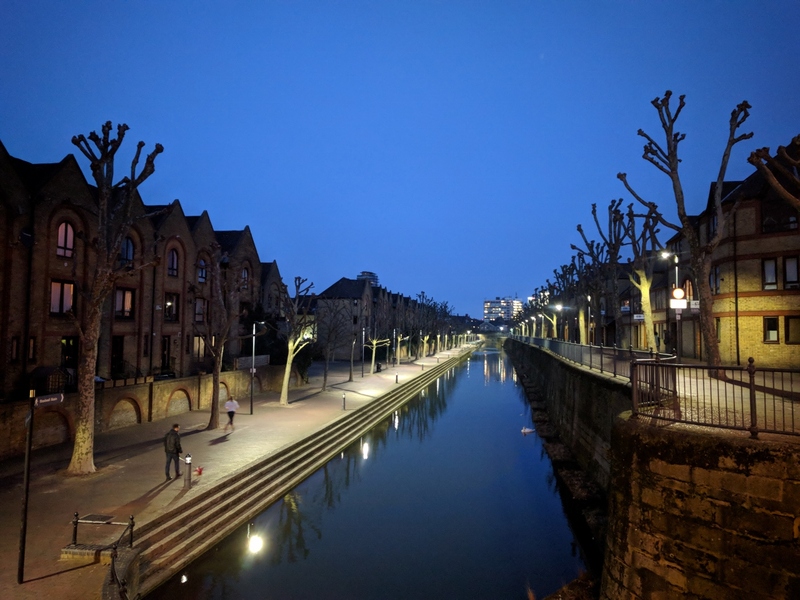 But the locks at either end of Hermitage Basin have been removed and now the aptly-named canal provides a lovely public walkway through Wapping. A barge entered the central basin from the lock this morning, heading towards the east basin (where the apartment buildlings are in the background). The barge caught our attention because it was swinging widely off course and the operator appeared to be adding more left helm in response, which only made it worse. It crossed near our bow and collided with the boat two berths over. We’re still a little shook at how close we were to having serious damage a week before getting underway for Norway. Enjoying wings and cask-conditioned beer from the rotating selection at the Draft House across Tower Bridge from St. Katharine Docks. 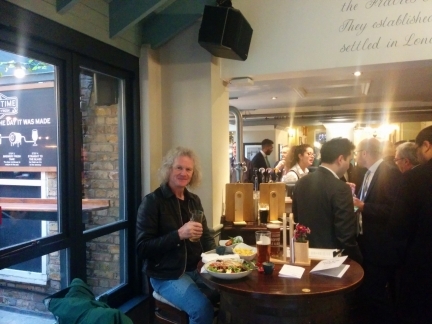 We’ve walked past The Minories pub several times, but haven’t stopped in. The pub is built into the arches beneath the Fenchurch Street viaduct—the rumble of trains passing above adds to the atmosphere. 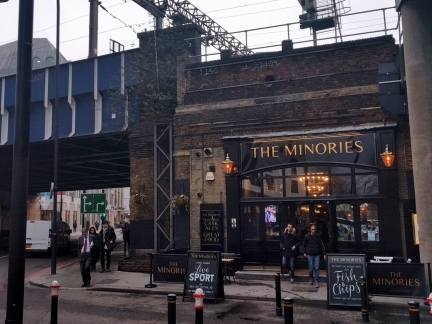 The Minories pub was packed for the Liverpool verses Manchester City Champions League quarter-final match. 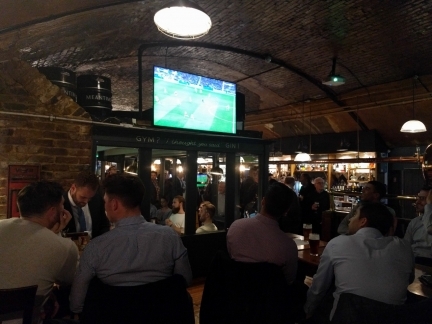 It was an incredibly exciting game, with Liverpool taking the win despite Manchester City dominating for the first half. Note the brick arches in the ceiling. 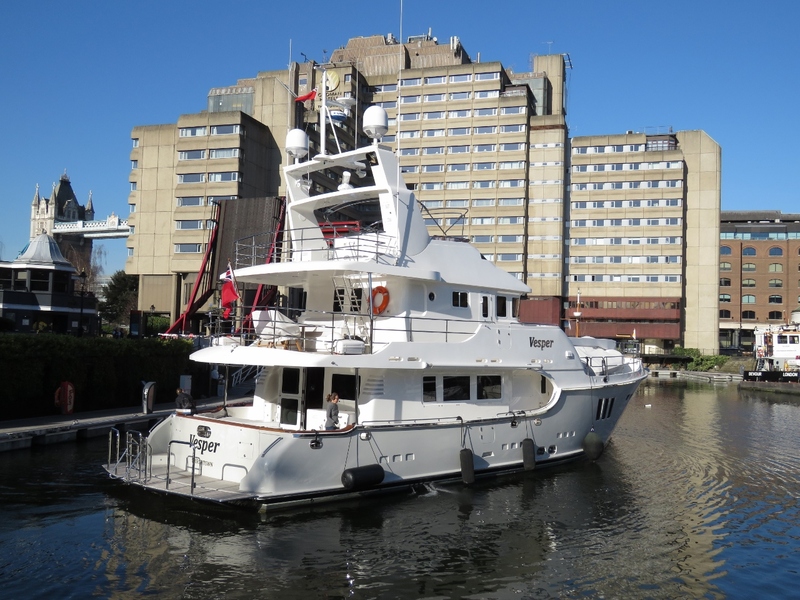 One of our last views to Dirona moored at St. Katharine Docks before we head off to Norway in a few days. It’s a moist and misty evening, just barely short of rain. 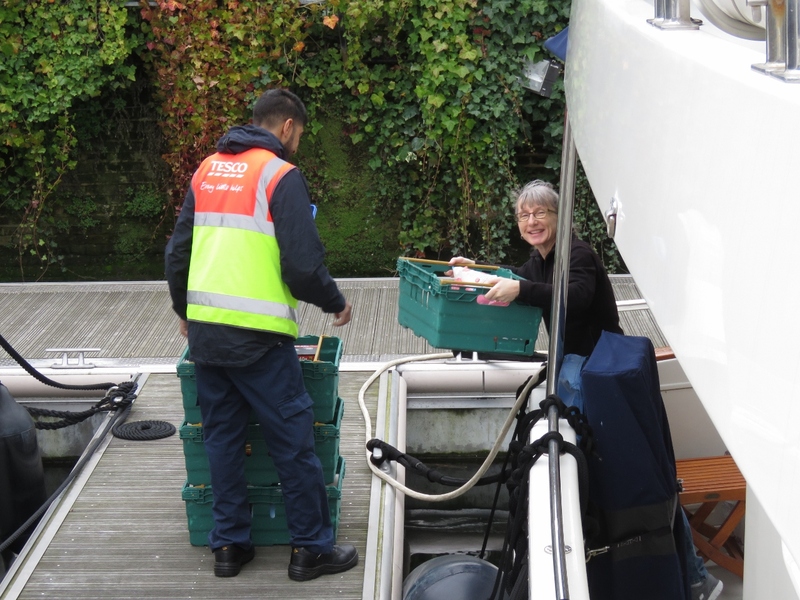 A final Tesco grocery delivery before we leave the UK for the Netherlands this weekend. 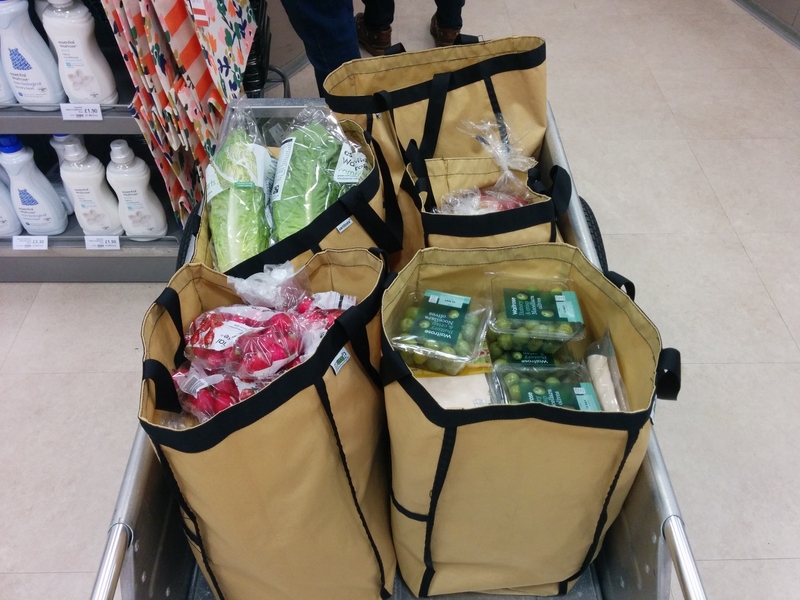 We brought the folding cart over to nearby Waitrose to stock up on fresh produce before we depart. The brown grocery bags are Earthtote Reusable Bags from reuseit.com. We love them. We can pack them right to the top, they can handle very heavy loads and they last super-well. We’ve never had to replace one yet. When transferring groceries to the boat (and sometimes to the dinghy first), it’s much more convenient to have a few large sturdy bags than many smaller ones that might rip and risk dropping items in the water. We haven’t had too much of a problem with windshield bugs either but it might be that the bugs can outrun us at 7 kts :-). It was a good read and it’s a credible thesis that there simply less bugs out there. That is almost certainly having impact all the way up the food chain where shortages at each level drive reductions at the next level above. You haven’t mentioned it since you’ve crossed the Atlantic but have you had issues with bug’s anywhere? Bugs haven’t yet been much of a problem in Europe so far but it depends upon time of year, nearness to shore, weather and location. We expect we will see them in Norway at some point. We have seen some minor quantities of bugs in Scotland’s Outer Hebrides Islands but not much anywhere else.